Scroll below to see where we came from. The Park National Bank of Newark, Ohio, is granted a national banking charter on July 6 after raising $100,000 in capital. 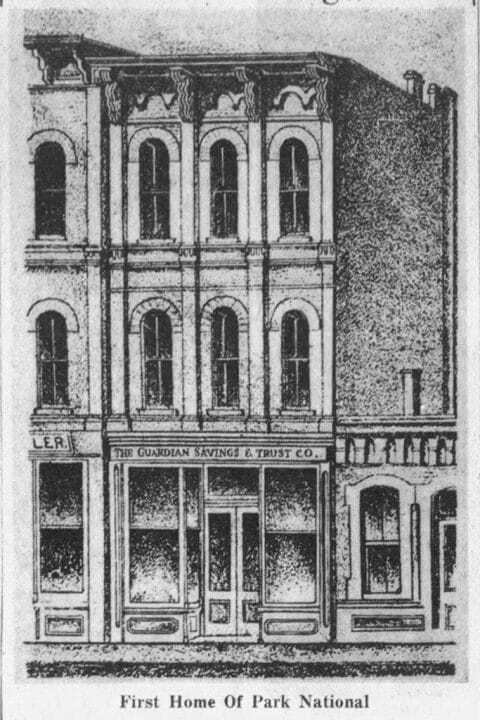 Alvin R. Lindorf, owner of a dry goods store on the Courthouse Square, became frustrated by a local bank – the rumor is he was turned down for a loan – and created The Guardian Savings and Trust Company in 1907 with the help of Augustus G. Wyeth and William W. Gard. 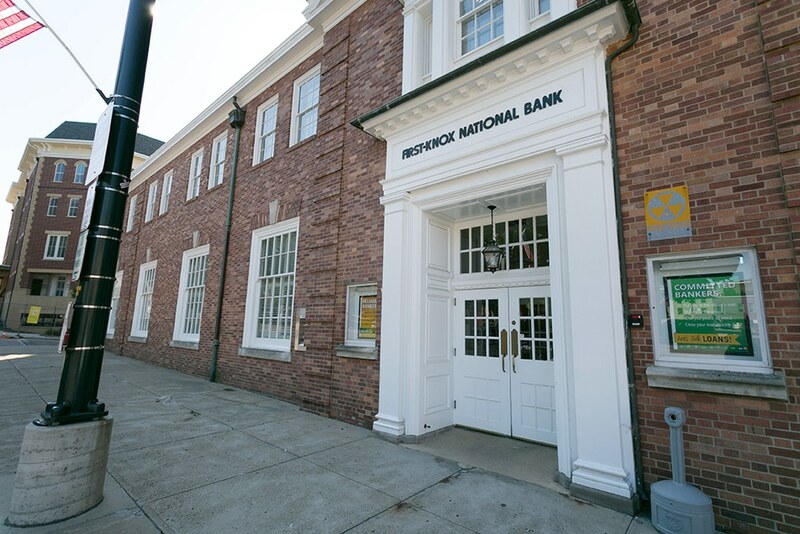 The next year Lindorf finances the purchase of a location at 32 North Park Place on the Courthouse Square and constructs a new building for the newly chartered and renamed Park National Bank. Wyeth serves as the first president, Lindorf is vice president and Gard is cashier. Alvin R. Lindorf becomes president of Park National Bank after the passing of Augustus Wyeth. 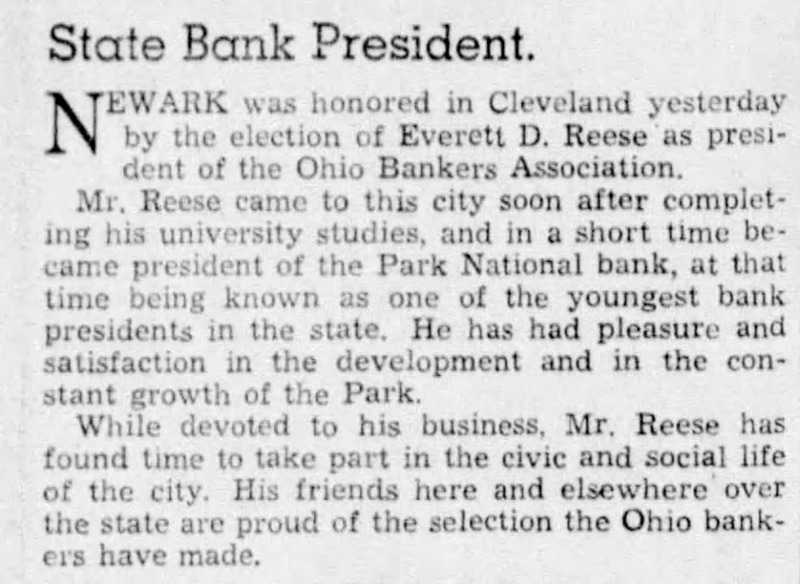 Everett D. Reese, an Ohio State University graduate who was hired June 1921 as an assistant cashier, is named president of Park National Bank in January by the board of directors and Alvin R. Lindorf becomes chairman of the board. Reese served as president until 1956, chief executive officer until 1960 and as chairman of Park’s board until 1979. Reese remained affiliated with Park as a board member until his death in 1995, completing 74 years of service. "(Former president) John Alford used to say that wherever Ev Reese sat down at the table, that was the head of the table." "All the world is conveniently divided into two categories - customers and prospects." Everett Reese persuades the board to raise $150,000 worth of capital stock to establish a Trust Department. 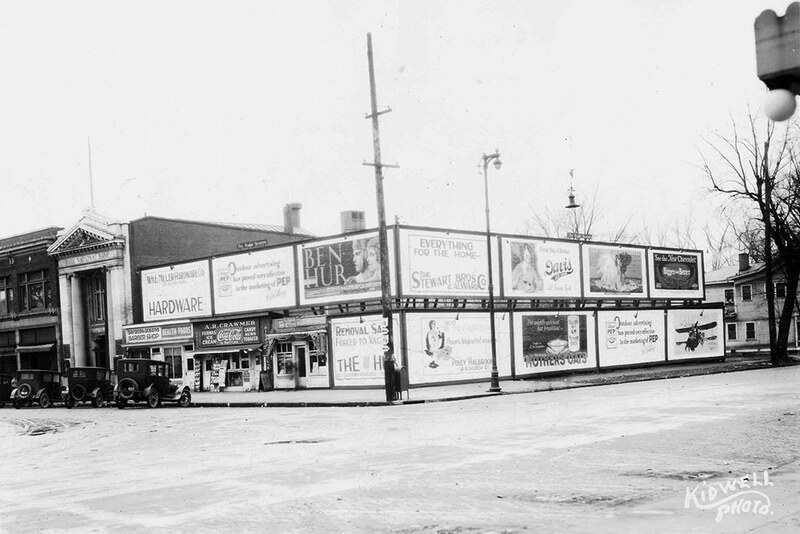 The Great Depression and a sagging bond market forces Park to recall its December 1930 stockholders’ dividend. This was the first and only time in its history that Park did not pay its regular dividend. 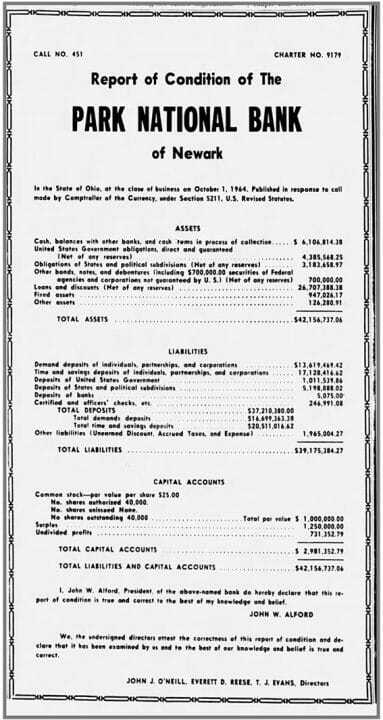 John W. Alford, a Baltimore, Ohio native and graduate of Indiana’s DePauw University, joined the bank as a bookkeeper. Alford would later become Park’s president, CEO and chairman. Because banking jobs were hard to get during the Great Depression and Alford was quite happy to land at Park, he didn’t ask how much the job paid. Reese, who personally hired Alford the same day after meeting him, finally told him three weeks later it was $65 a week, after realizing Alford had never asked. Park reaches more than $1 million in loans and $4 million in assets. Everett Reese is elected by his peers to become chairman of the Ohio Bankers Association, the predecessor of the Ohio Bankers League. Park begins making three-month calendars with its logo and distributing them free to the public. The calendars are still offered – and still free – today. Park expands outside of Newark for the first time, opening banking offices in Kirkersville on April 15 and Hebron on April 16. At the 44th annual stockholders’ meeting, $300,000 of new capital stock is approved to open the Kirkersville and Hebron branches. 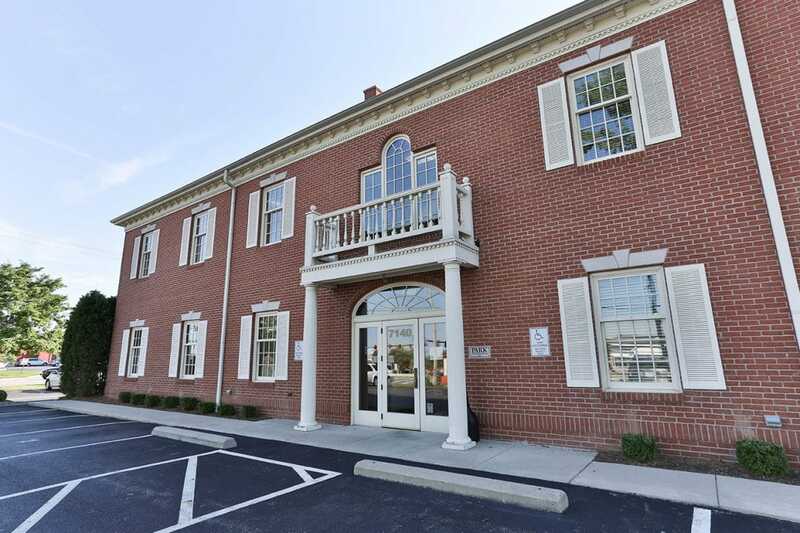 Park acquires Kirkersville Savings Bank to serve as its second location, and a former Union Township trustees building was remodeled for the Hebron office. 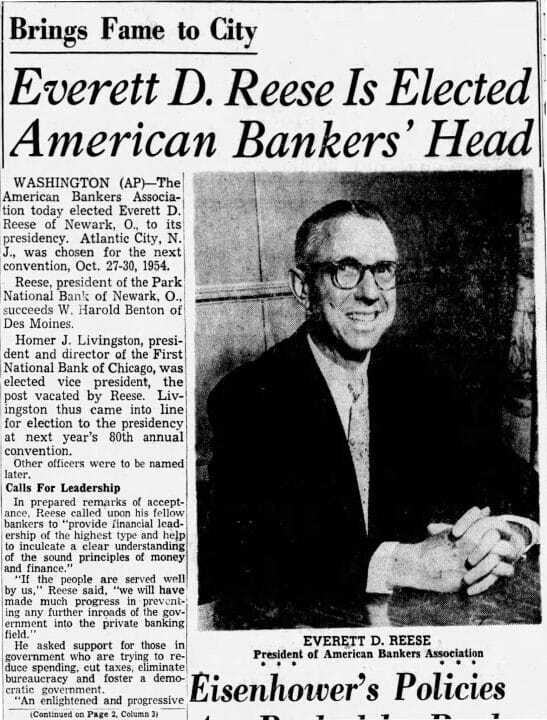 Everett Reese is elected president of the American Bankers League, the predecessor of the American Bankers Association. In January, John W. Alford is named the fourth president of Park National Bank and Everett Reese becomes chairman and continued as a trust officer and CEO. Alford was a World War II Navy veteran and rejoined Park after the war. He truly believed in giving back to the community. He infused Park culture with that mindset and led by example, serving as president for the Newark Area Chamber of Commerce, director for the Licking County Industrial Growth Corp. and trustee for Denison University and the Thomas J. Evans Foundation among many other charitable and community endeavors. "As a community goes, so go its banks." Park celebrates the grand opening of its new headquarters at 50 N. Third St. in Newark, Ohio, on May 19. The president’s and chairman’s offices in the southwest corner of the building are designed with sliding glass doors instead of walls to show clients and associates they are always accessible. 10,000 collectible “Parky Pig” banks are first issued to mark the grand opening. Everett Reese and John Alford stated that assets of the bank were approximately $27 million when the new building opened and the facility was expected to support growth to $100 million in bank assets. The same office building continues to serve as the main office with total assets exceeding $7.7 billion on December 31, 2017. 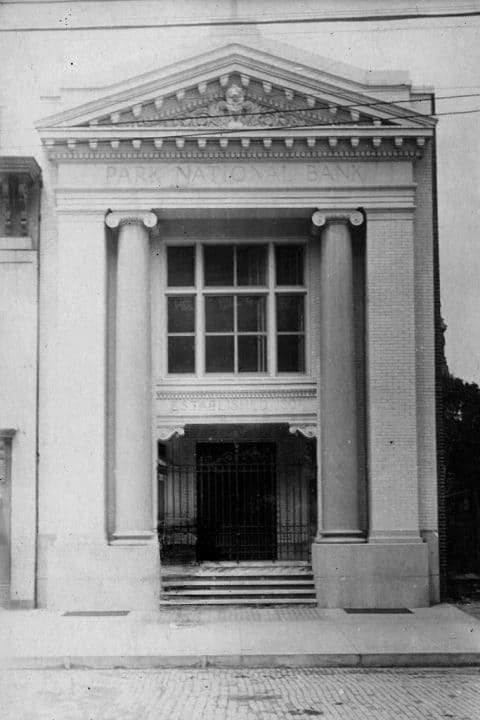 The original offices occupied by Reese and Alford continue to be occupied by the top two officers of the bank. William T. “Bill” McConnell, a graduate of Denison University, veteran of the United States Air Force and a recent graduate of Northwestern University with a master’s degree in business administration, joined Park National Bank as the first management associate. Park opens the Southgate office at the newly built Southgate Shopping Center on June 28 with assistant trust officer William T. McConnell as its manager. One year after its opening, the office was handling 1,500 customers per week and had brought in more than 500 new accounts. By 1963, more than 2,200 people were doing business there weekly. Geraldine Marston, who joined Park in 1951 in the Proof Department and later became a vice president, wins the Jean Arnot Reid Award from the prestigious National Association of Bank Women as “the most outstanding young bank woman in the country.” In 1965, after a ruling by the Comptroller of the Currency, she became the first female bank officer. John Alford is named president of the Ohio Bankers Association. Park introduces a new product, the BankAmericard, which was the earliest development of the all-purpose credit card. Park is the second bank in Ohio and among the nation’s first 200 banks to offer this card. BankAmericard would eventually be renamed Visa. On May 14, Park introduces a new phone number service for customers where they can get their “Time and Temperature.” The time is set to the atomic clock in Fort Collins, Colorado. The popular service is still being used today at 740-349-0511 and draws an average of nearly 46,000 calls monthly. Park opens the Consolidated Computer Center to automate data and check processing. The center operated from the Krebs Building (later renamed for John Alford on October 15, 1985). Park sees considerable growth during the 1960s. Trust accounts grew from 24 to 139 accounts, assets grew from $29.9 million to $76.5 million, deposits grew from $26.5 million to $66.2 million, loans grew from $16.7 million to $45.2 million and net income increased from $330,000 to $802,000. Park acquires Peoples State Bank of Granville in August and establishes its new Granville office. Park now operates 7 offices in Licking County. C. Daniel DeLawder, a Newark native and Heath High School graduate who would become Park’s president, CEO and chairman, joins Park as a management associate following his graduation from Ohio University. Park installs its first Cash ’n Carry machine in July, which allows customers 24-7 access for account withdrawals or cash advances of $25 or $50 twice a day on their BankAmericard. Park was the third bank in the state to offer the machine. Park establishes the Employee Community Service Fund to allow associates to contribute directly to community service organizations. The fund started with $6,800 and in 2017 eclipsed $4 million in total giving. Park acquires Utica Savings Bank and opens its new office in Utica on October 23. On January 14, Park opens the Johnstown office in a historical building called the Johnstown House. Park acquired a 2,600-square-foot building from the Borden Company at 990 North 21st St. After spending $362,000 for the building, renovations and equipment, Park opened the 21st Street office on March 21. To celebrate and promote the new opening, the branch gave away small “Parky Pig” banks. On December 7, Park opens its McMillen office on West Main Street in Newark. After the Ohio Legislature passed a bill in 1978 permitting banks to operate branches in contiguous counties to the counties where they were incorporated, Park opened its first office outside Licking County in July at 150 E. Broad St. in Columbus. During the 1970s, Park’s net income grew to $3.6 million in 1979. The number of female officers at Park rose in 10 years from just two (Betty Birmingham and Geraldine Marston) in 1970 to eight, including Marston, Cynthia Crane, Suzanne Graves, Pamela Furnas, Mary Larimer, Shirley Matheny, Donna Buris and Marilyn (Skinner) Porter. Park elected Nancy Shrider Chiles (now Nancy Chiles Dix), president of oil and natural gas producer W.E. Shrider Co., as the first woman to its board of directors. She went on to serve in the Ohio Senate and became the first woman inducted into the Ohio Oil and Gas Association Hall of Fame. Bill McConnell is named president of the Ohio Bankers Association, the third Park president to be elected to that position. David L. Trautman joins Park as a management associate upon graduation from Duke University. Trautman would go on to become Park’s seventh president as well as CEO. Park National Bank purchased Fairfield National Bank in Lancaster, Ohio, on May 1 from National City Corporation. This was the first merger that brought a multiple-location, out-of-county bank into the fold. It became a model for how Park continues to do business based on Bill McConnell’s proposition: When the situation is right, allow banks to keep their identity, board and people intact. 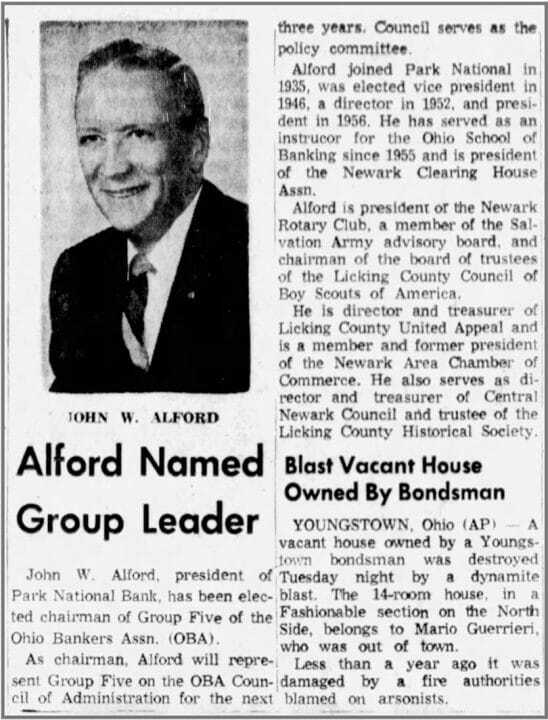 Park National Bank renames former Krebs Building “Alford Building” in honor of Chairman John W. Alford. Park National Corporation (PRK) is formed. Park purchased the Richland Trust Company in Mansfield, Ohio, from Society Bancorporation. Park expands its presence in Heath and opens a branch on South 30th Street. On August 31, Park merges with Mutual Federal Savings and Loan, based in Zanesville, Ohio, as part of the Park National Corporation. Mutual Federal was renamed Century National Bank in June 1997. PRK common stock begins trading on the NASDAQ exchange. Park introduces the Freedom Years program designed for customers age 50 or better with $10,000 or more on deposit. The program offers retail and recreational discounts, unique experiences, informational seminars and travel tours for its members. Dan DeLawder is named president of Park National Bank. Bill McConnell continues as CEO and is named chairman by Park National Bank and Park National Corporation. John Alford continues as chairman of the Executive Committee. DeLawder, like his two predecessors, served on the board of the Federal Reserve Bank of Cleveland. He served as president of Park until 2004 and as chairman of the bank and PRK since then. He was CEO of both from 1999-2013. Park acquires Scope Aircraft Finance, founded in 1975 and which specializes in loans for high-performance piston, turboprop and light jet aircraft, from a private individual. By the end of 2017, loans in 41 states and Puerto Rico totaled more than $260 million, up from $15 million in 1994. Park introduces the Visa® CheckCard, a debit card that pulls funds automatically from customers’ checking accounts. 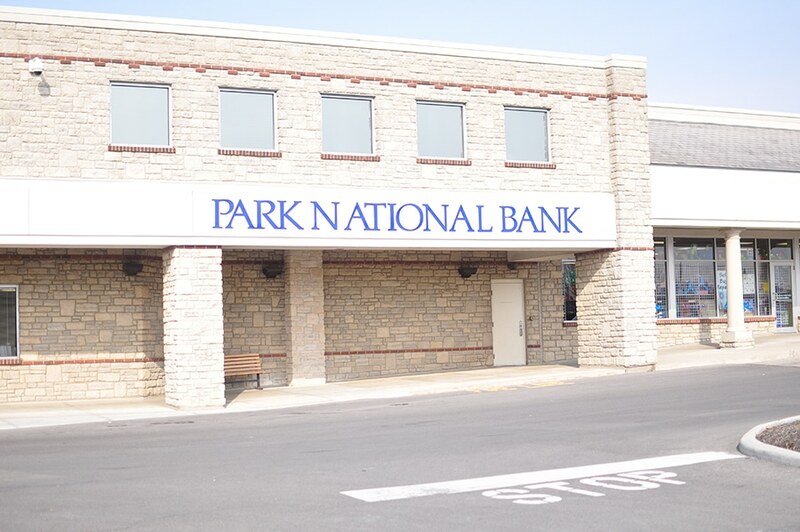 Park National acquires First-Knox National Bank, based in Mount Vernon, Ohio, and Farmers and Savings Bank, based in Loudonville, Ohio, merge with Park. From 1997-2002, David Trautman serves as the First-Knox president before returning to Park as executive vice president. Park also expands to Pataskala and opens a full-service branch in the Pataskala Kroger store. 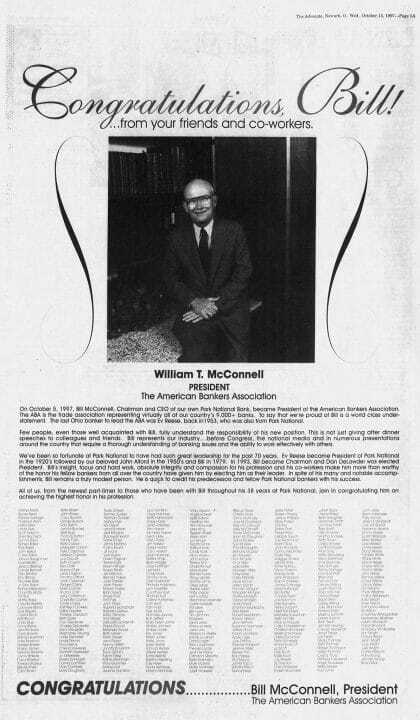 Bill McConnell follows in Everett Reese’s footsteps to become president of the American Bankers Association, the only two Ohio presidents to serve the national trade organization in that role in the 20th century. Dan DeLawder is elected president of the Ohio Bankers Association, becoming Park’s fourth president to head up the state trade association. Also, Park National’s Trust Department exceeds $1 billion of assets under management for the first time, with Park National Corporation reaching $1.8 billion in assets. Less than two decades later, trust assets for PRK would eclipse $5 billion. Park opens a banking office in the Deo Drive Kroger store in Newark. 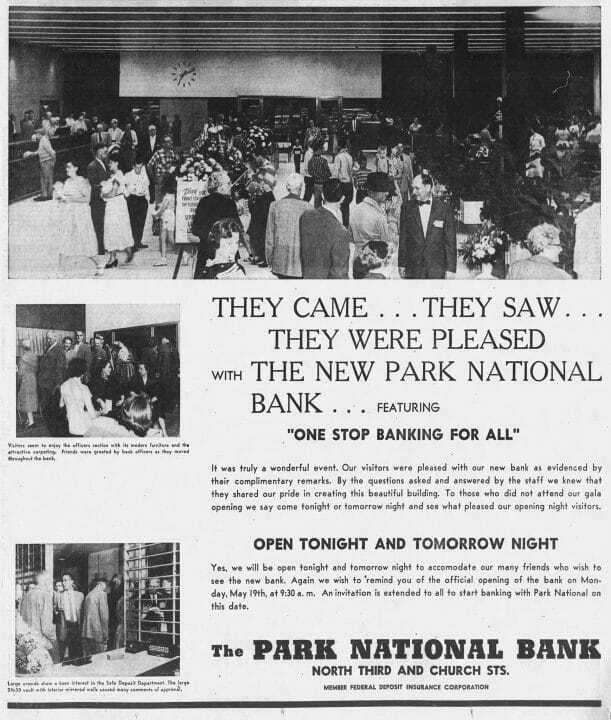 United Bank in Bucyrus, Ohio, and Second National Bank in Greenville, Ohio, join the Park National organization. Park National Bank launches its first banking website on August 16. 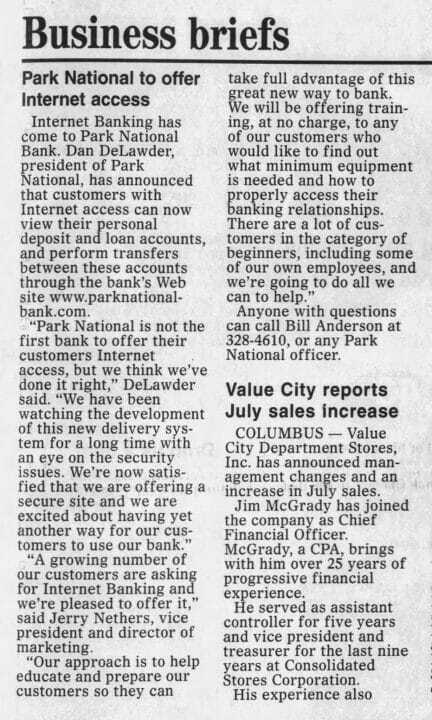 On the same day on March 23, three more Ohio banks, all subsidiaries of Security Bancorporation, join Park National Corporation: Springfield’s Security National Bank and Trust Company, Piqua’s Third Savings and Loan Company (which changed its named to Unity National Bank in December 2001) and Urbana’s Citizens National Bank (which merged with Security National Bank in 2009). Harry O. Egger continues as CEO of Security Bank Division and joins the Park National Corporation Board of Directors and becomes vice chairman of the PRK board. 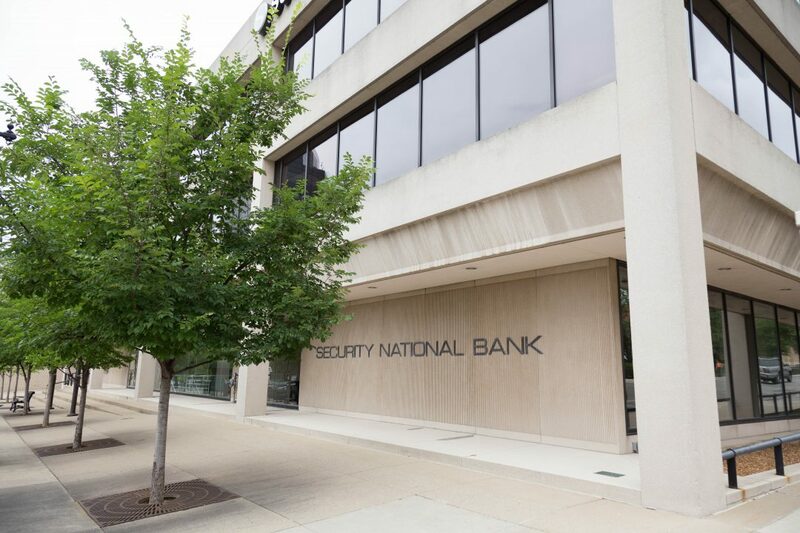 Park acquires First Federal Bankcorp Inc. in Zanesville and merges it with Century National Bank. Park launches new Health Savings Accounts, giving individuals the opportunity to save tax-free money for health expenses. Park opens a branch in downtown Delaware on North Sandusky Street. Park also opens branches in the Gahanna Kroger and in Worthington. On January 3, Park acquires First Clermont Bank in Milford, Ohio. 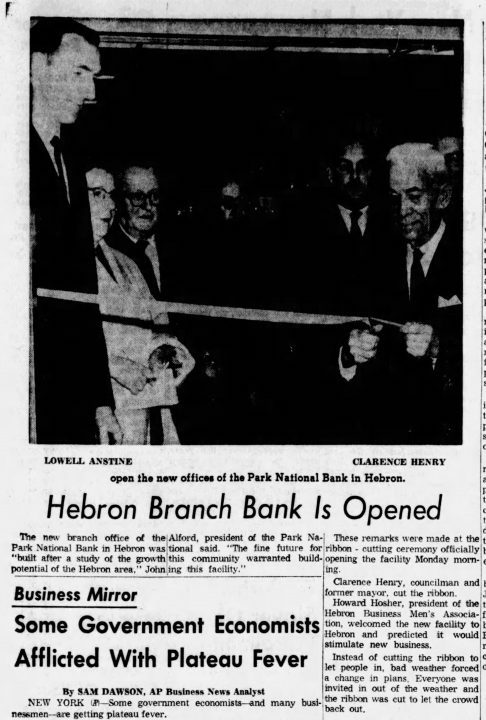 On June 12, First Clermont merges with Park to form Park National Bank, Southwest Ohio & Northern Kentucky. In December, Park National Corporation is named the third-best banking company in the U.S. based on financial performance by Bank Director magazine’s Top 150 Performers list. 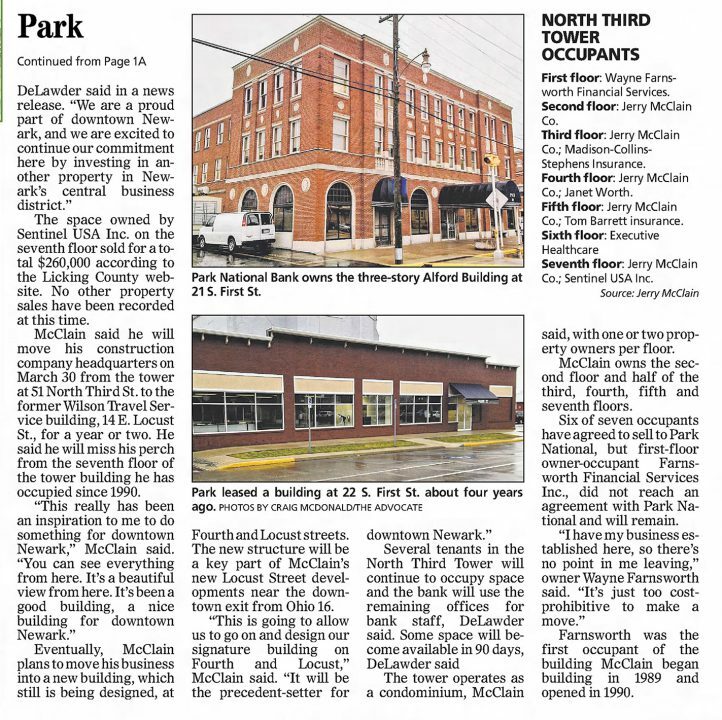 Park’s Worthington office relocates to a new building on North High Street. Park also opens a new banking office with extended hours in the Reynoldsburg Kroger on Main Street. Business First of Columbus lists Park as the No. 1 Community Bank for the third consecutive year. Park launches the Difference Maker award in Heath. The award is given annually to a person, nominated by the community, for making a positive impact locally. Difference Makers are honored in six communities – Heath, Hebron/Buckeye Lake, Johnstown, Licking Valley, Pataskala and Utica – as well as among Park’s Freedom Years members. 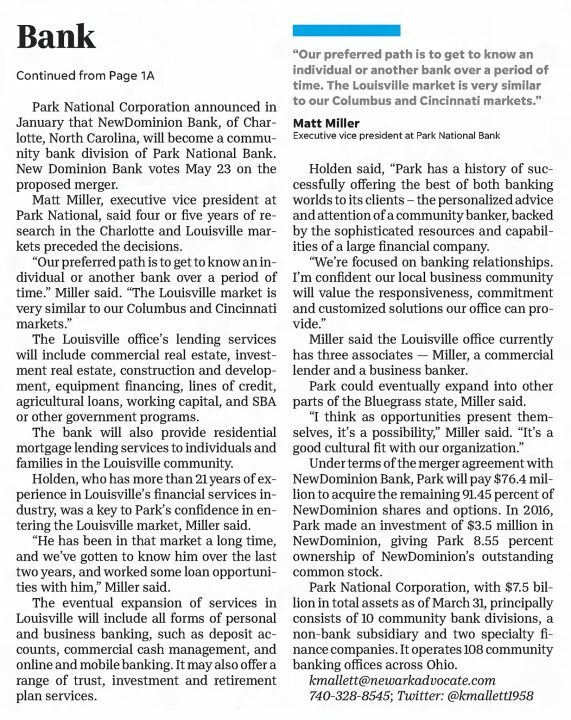 Park acquires Cincinnati-area Anderson Bank and merges it with Park National Bank. Park National Bank receives the Governor’s Award for Business Support of the Arts. Park goes outside the Midwest for the first time and acquires Vision Bancshares Inc. and its 18 branches in Florida and Alabama. Deteriorating economic conditions led to a significant increase in troubled loans by the end of the year. The Vision purchase soon became one of Park’s greatest challenges and failures. Brady T. Burt joins Park as chief accounting officer and becomes chief financial officer in 2013. 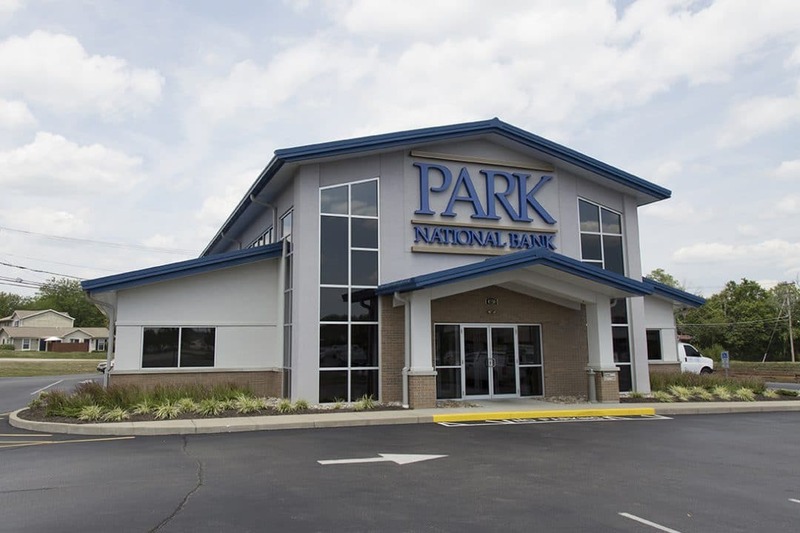 Park National Corporation combines its Ohio banks under a single charter with The Park National Bank. Each bank division continues with its own identity and leadership while centralizing most operations. "The key to this action is that we'll make significant improvements while remaining true to our core value of delivering extraordinary service." David Trautman becomes the fifth Park president to be elected as chairman of the Ohio Bankers Association. Park National bank recognizes 100 years of serving families, businesses and communities with ongoing celebrations, food, music, client specials and the unveiling of a limited edition Parky Pig bank. On December 23, Park receives a $100 million loan through the U.S. Treasury Department’s Capital Purchase Program (CPP) that was intended to help increase its lending. The CPP is part of the Troubled Asset Relief Program for financially healthy banks. Park is well capitalized but participated in the CPP, in part, to ensure it could compete with other banks receiving the federal funds. Park paid back the funds it borrowed in 2012, following its sale of Vision Bank. Park National Bank helped secure a $750,000 grant for the Salvation Army to build a homeless shelter on Arch Street in East Newark. The facility opened in the summer of 2010 and has been ably serving the community since. Park National launches PNB Cares, a weeklong volunteer program for its associates to give back to the communities Park serves. In the first year, 430 associates worked on 40 projects in 10 communities and Park donated 1,900 hours of service. In the seven years since its inception, PNB Cares was extended to two weeks and has contributed nearly 13,000 collective volunteer hours to about 40 organizations each year. Bill McConnell receives the Ohio Bankers League Pioneer in Banking Award for his vision, innovation and leadership in helping advance the state’s banking industry and the communities it serves. Park National and its associates pledge $1 million to support Central Ohio Technical College and The Ohio State University at Newark’s Next Generation Challenge Scholarship Campaign. Bill McConnell, chairman of the campaign, and his wife Jane donated another $1 million. Director emeritus J. Gilbert Reese and his wife Louella match community gifts up to $10 million in aggregate. It was the most successful fundraising effort for either institution, raising nearly $21 million. Business First honors Park National with the Corporate Caring Award in the large-size company category for supporting education, the second time Park has been so honored. Park divests the performing assets of Vision Bancshares Inc. to Home Bancshares Inc. and its affiliate, Centennial Bank. Licking/Knox Goodwill Industries Inc. names Park National Bank as its 2011 Community Partner of the Year. Park National Bank expands its presence in downtown Newark, purchasing the second through seventh floors of the North Third Tower at 51 N. Third St. The tower is directly across the street from Park’s main office, and the purchase includes 150 parking spaces to accommodate Park’s growing workforce. Park launches its mobile app, bringing banking to clients through their smartphones and tablets. David Trautman is named chief executive officer of Park National Bank and Park National Corporation while retaining his role as president of both entities. Dan DeLawder continues as chairman of PRK and PNB. Trautman joined Park in 1983 and served as president of the First-Knox division from 1997-2002. He rejoined Park in 2002 and was named president of the bank and PRK in 2005. The Ohio Statewide Development Corp. honors Park National Bank as its 2014 Community Bank of the Year for its effort to help small businesses. Park launches a new business mobile app, based on customer feedback, that allows owners and managers to securely approve transactions, deposit checks, view account balances, receive alerts and transfer money from their smart phones. Bill McConnell, after 55 years of service to Park, is named the bank’s director emeritus of the board. The Deo Drive Kroger in-store office moves to the new Kroger Marketplace on North 21st Street. Park National Bank reaches $7.4 billion in total assets with net income of $84.5 million. Park National turns its 12-hour Customer Care Center operation into a round-the-clock phone, email and web chat service on January 2. In the month of January, the center handled 55,677 calls, 3,332 web chats and helped process more than 100 online checking or savings account applications. Park promotes Matt Miller, who graduated from the University of Akron, to executive vice president of PRK and PNB on April 1. Miller joined Park in 2009 as vice president and subsequently was promoted to senior vice president and chief accounting officer. The Columbus District Office of the U.S. Small Business Administration honors Park with its District Director Rising Star Award for ensuring small businesses can access capital to increase jobs, expand markets, launch new products and invest in new equipment. Earlier in the year, the Community Capital Development Corporation names Park its 2016 Bank of the Year for providing $3.32 million in small-business loans that led to $11.3 million in expansion. Farmers Bank, which was aligned with First-Knox National Bank prior to merging with Park, decides to merge its identity with First-Knox to take advantage of greater support and resources. 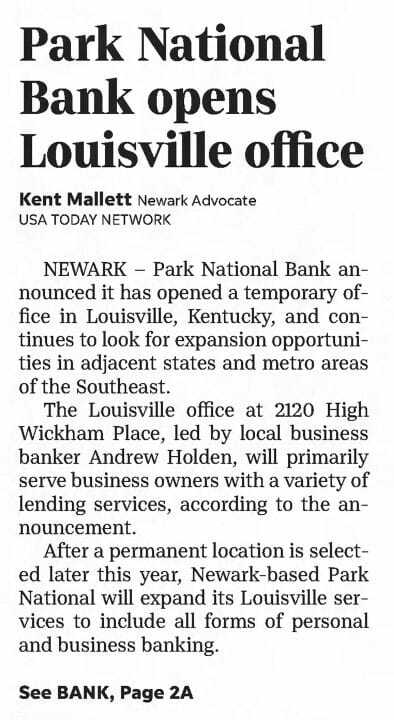 Park expands its presence into Kentucky and opens a temporary loan production office in Louisville in May. The office will primarily serve business owners with a variety of lending services. The 4-person team plans to open a full-service banking office before the end of the year. 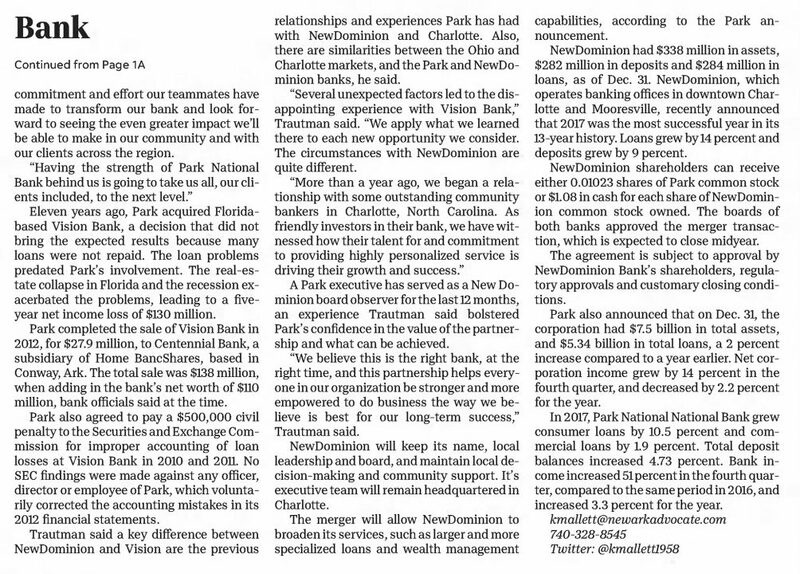 Park acquires NewDominion Bank with two offices in Charlotte and Mooresville, North Carolina, on July 2, 2018. NewDominion becomes the 11th affiliate of the $7.5 billion Park National Corporation.